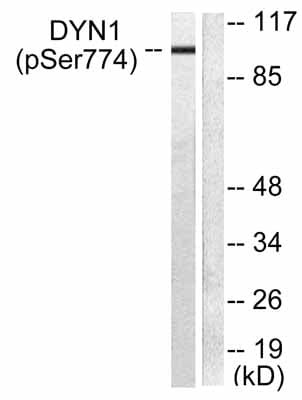 This antibody detects endogenous levels of Dynamin 1 only when phosphorylated at serine 774. Synthetic phosphopeptide derived from human Dynamin 1 around the phosphorylation site of serine 774 (R-R-SP-P-T). Our Abpromise guarantee covers the use of ab55324 in the following tested applications. WB: 1/500 - 1/1000. Detects a band of approximately 98 kDa (predicted mouse molecular weight: 98 kDa). Lane 2 : Mouse brain extract treated with the immunising phosphopeptide. Publishing research using ab55324? Please let us know so that we can cite the reference in this datasheet. There are currently no Customer reviews or Questions for ab55324.